Finished wet wings, 11gal header tank (with capacitance probe, 47gal total cap. in 3 tanks), engine mount (for Dynafocal Lycoming), wheels and brakes (with dual brakes, remote reservoir, and mounted tires), James “Holy?Cowl and Cooling Plenum (w/ round inlet inserts; injected or carb version; old cowl is pictured), fiberglass parts (wing tips, tail tips, wheel pants, wing root fillets), T-18 Canopy (inc. shipping when builder is ready to install), and crating charges. Tricycle gear requires about $600 of additional nose wheel parts besides the $230 nose gear leg. 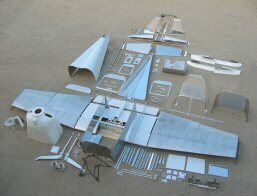 A list of parts is provided that can be purchased from Van’s Aircraft.